If there’s one thing you can say for drug smugglers, they’re creative. They’ll stop at nothing to get their drugs into the United States, and they’re getting more and more inventive. 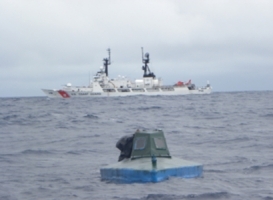 While patrolling off the coast of California, the Coast Guard cutter USS Dallas discovered a drug-smuggling submarine. Technically, it’s only a semi-submersible, but the SPSS discovered off the coast of Alameda, California, was hauling 3 tons of cocaine. The difference between a SPSS and an actual submarine is that the SPSS is only mostly underwater, and isn’t capable of being totally underwater. This makes buying a SPSS much cheaper, and abandoning a SPSS much easier to do when confronted by the coast guard. You just pull a plug on the bottom or open a valve, and the whole thing sinks to the bottom of the ocean, disposing of the evidence before the cops can bust you! The SPSS still has a bit of a profile, but as you can see from the picture, it’s definitely not easy to spot. Given the paint scheme and the mostly-underwater presence, you can see how that’d be a hard boat to stop. It’s the best of both smuggling worlds.